After the announcement of the Galaxy A7 (2018), which is Samsung’s first smartphone to feature a triple-camera setup at the back, the Korean giant is gearing up to release yet another device next month that is expected to take smartphone camera capabilities to the next level. According to information reported by a different publication, the device in question is going to be called the Galaxy A9 Star Pro and it is going to be equipped with two cameras lenses that will be capable of zooming into the subject. This can give rise to different speculations, such as the handset being capable of getting 3x optical zoom functionality. Let us dive into more details regarding the latest specifications. 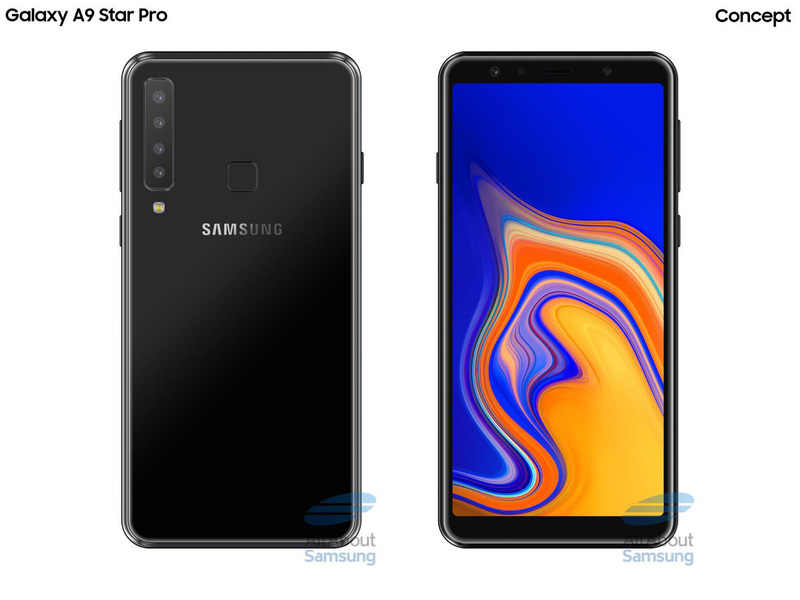 According to the render shared by AllaboutSamsung, the name of the upcoming quadruple camera smartphone is going to be Galaxy A9 Star Pro, and here are some very interesting specifications of the device when it comes to the optics. The source claims that the smartphone will sport a 24MP primary camera, paired with an 8MP wide-angle lens capable of a 120-degree FOV, of Field of View. The third lens is going to be housing a 10MP sensor with zoom capabilities, while the last one will also be capable of zooming in but will sport a maximum resolution of 5MP. At the front, a 24MP selfie camera has been listed. It will be interesting to see why Samsung incorporated two zoom lenses if that is actually the case, but it gives rise to a rumour that the Galaxy A9 Star Pro might be capable of 3x optical zoom, just like the Huawei P20 Pro. After all, what good is a smartphone getting equipped with a quadruple camera system if it does not even have the ability to zoom into the subject for a lossless image quality? The Galaxy A7 (2018) disappointed in this regard by not featuring optical zoom, so let us hope that the alleged Galaxy A9 Star Pro will make up for that. Other specifications of the smartphone include a 6.2-inch Full HD+ Super AMOLED screen, along with a Snapdragon 660 chipset, and a large 3,730mAh battery. Those are some decent specifications for a smartphone that belongs to the mid-range category, although we’d be happier to see a Snapdragon 710 listed as part of the internals. Let us see if these details end up becoming true or not on October 11. Like always, we’ll provide you with timely details but let us know down in the comments on what you’d like to see from the upcoming Galaxy A9 Star Pro.